In February 2007 I chanced upon a marvellous cookbook: The Ultimate Recipe Book by Angela Nilsen. It had just been published, so I’m not sure how (or where) I came across it so soon, in the days before my compulsive food blogging. But I was instantly taken with Nilsen’s approach of selecting 50 classic dishes and setting out to define the ultimate recipe for each one. In her quest she used her own considerable skills and knowledge of cooking and also consulted with many expert chefs, food writers and regional specialists to glean as many insider tips and suggestions as possible. Then she tested, tested and tested again, fine-tuning as she went. The result is this wonderful cookbook, published by BBC Books under the brand of Good Food Magazine (for whom Nilsen worked as Food Editor and then Acting Food Director before creating the Ultimate series of recipes). 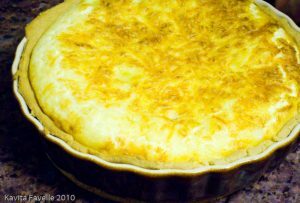 In her introduction to quiche Lorraine, Nilsen points out that “what you don’t put into a quiche Lorraine is as important as what you do”. It’s a good reminder that quiches with “salmon, watercress, brie, even broccoli” might be jolly nice but are not Lorraine! Quiche Lorraine is a simple dish with just a few ingredients. To me, that’s where it’s beauty lies. We enjoyed this quiche recipe when we first made it, not long after buying the book but with the huge influx of cookery books I’ve amassed in the last couple of years, the book had been neglected at the back of the shelf. 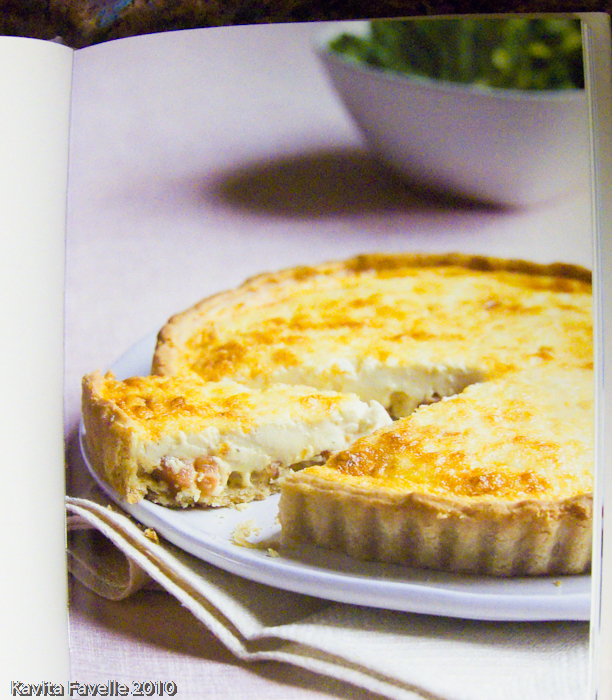 Recently I yearned for a good home-made quiche and dug the book out again. 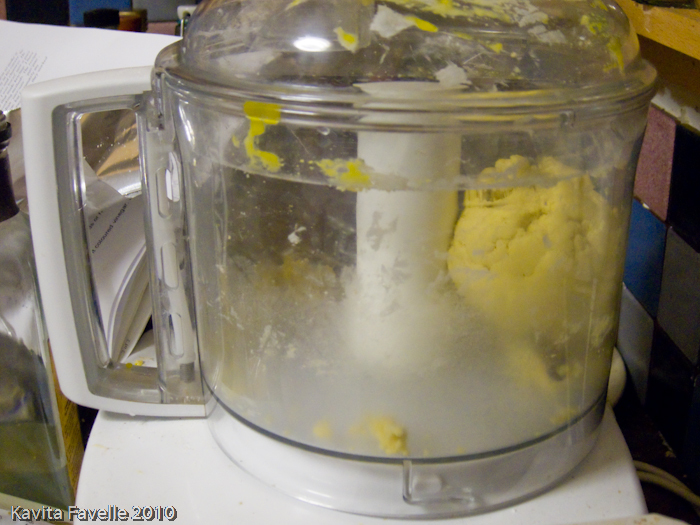 Make the pastry by putting flour, butter, egg yolk and cold water into a food processor. Process in pulses until the mix binds. 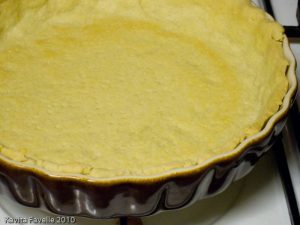 Line a 23cm diameter flan dish or tin (we buttered and floured ours). Nilsen suggests a tin that is about 2.5 cm in height. On a floured surface roll the pastry out as thinly as you can. 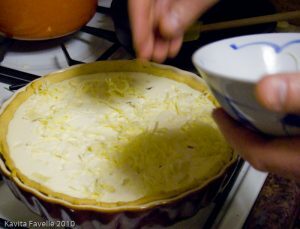 Ease the pastry into the base of the dish, trimming the edge so it sits slightly above the lip of the dish (to allow for shrinkage). Lightly prick the base with a fork and chill for 10 minutes. Preheat the oven to 200 C (180 C fan). 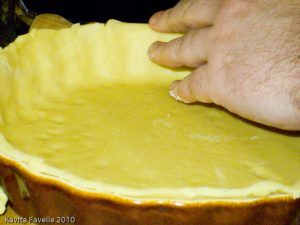 Line the pastry with foil and weigh down with baking beads (or any other suitable weight – we used a smaller metal pie tin). Bake for 15 minutes. Remove the beans and foil and bake for another 4-5 minutes until the pastry is pale golden. If you notice any small holes or cracks, patch up with leftover pastry trimmings. While the pastry cooks, prepare the filling. Dry fry the lardons for a few minutes until they start to colour. Nilsen suggests discarding the cooking fat and draining but we tipped it into the custard mix for added flavour. Cut three quarters of the cheese into small dice and finely grate the rest. 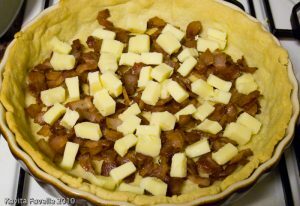 Scatter the cooked lardons and diced cheese over the pastry base. 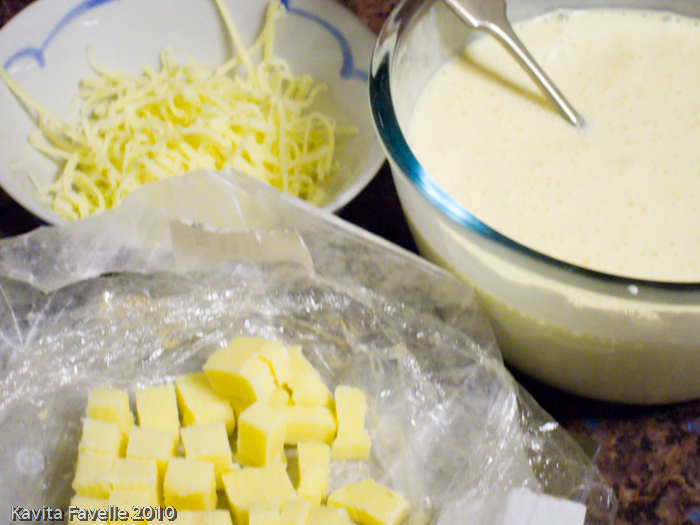 Beat together the crème fraîche, double cream and (pre-beaten) eggs. Add nutmeg and seasoning. 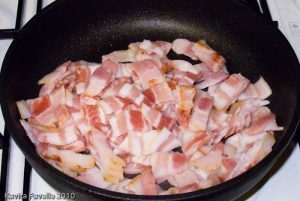 (You shouldn’t need much salt given the bacon and cheese). Pour into the pastry base, over the bacon and cheese. 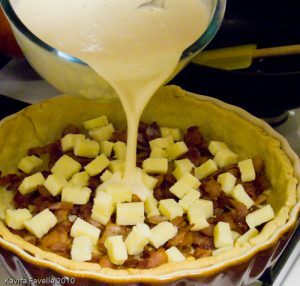 Scatter the grated cheese on top. Bake for about 25 minutes at 190 C (fan 170 C) or until golden and softly set. The centre shouldn’t feel too firm. Remove from the oven and allow the quiche to settle for a few minutes before serving. As you can see, our pastry was just a touch soggy in the base, though this didn’t detract at all, for me. This may be because we didn’t roll the pastry thin enough or because it needed an extra minute or two of blind baking. This is a really delicious recipe and very straightforward. I definitely recommend that you try it. 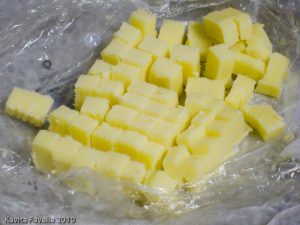 Use only the recommended 50 grams of cheese if you want a milder, more custardy flavour. 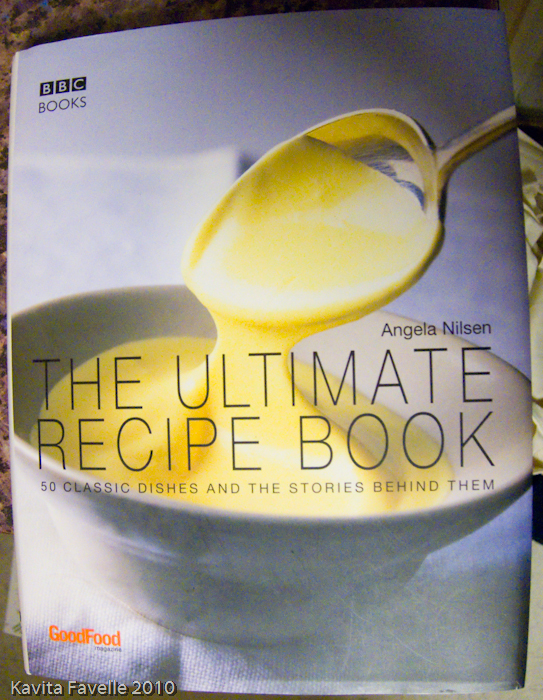 The Ultimate Recipe Book by Angela Nilsen is currently available from Amazon for just £10.90. A list of the recipes covered can be found in one of the customer reviews. 12 Comments to "Angela Nilsen’s Ultimate Quiche Lorraine"
the first thing I notice was you using Dunhay bacon…love it, it's my favourite bacon that I can buy in the supermarket…it really is first rate bacon and their streaky rashers the fat crisps up lovely and great flavour…so that automatically caught my attention! 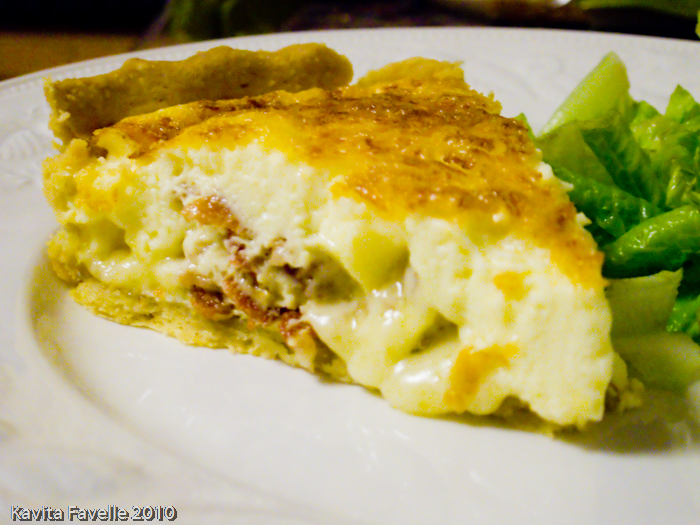 Your filling looks as if it has a light texture, good quality to have in a quiche. Soggy bottoms happens easily with ceramic type of dishes because they are really bad conductors of heat, metal tins will help to carry on heating the bottom once the filling is in and in the oven. I love that book! And this recipe is brilliant, only topped by Simon Hopkinson's version in which he includes, inauthentically, philly cheese. Another Ultimate fave of mine is the Coronation chicken: the ingredients sound weird, but it's fab. 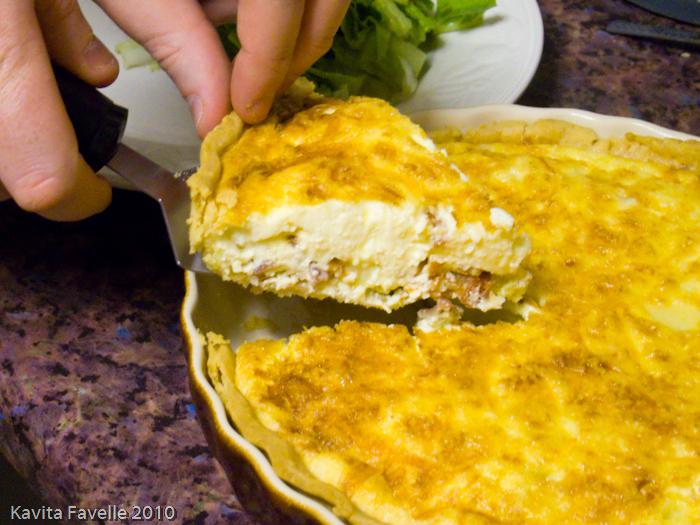 I love a wobbly quiche and that one looks super-wobbly. Also, well done on making me crave something I associate with summer on this cold winter's day! 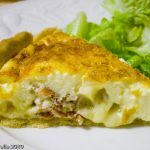 Fran – haven't tried that, not usually a fan, but may give it a go on your recommendation!MiMi – because I prefer quiches hot, I think of them as good winter dishes too. Cold, yes, they remind me of picnics but… hot, oh so comforting! Oh wow I didn't know they'd made that series into a book! I've been subscribing to BBC Good Food magazine/pinching my mum's copies for years and I've had a lot of good recipes from Nilsen's Ultimate Series! I can also highly recommend http://www.bbcgoodfood.com/recipes/3092/ultimate-chocolate-cake. Everyone you serve this to will love you forever! I love those old favourite recipe books – I rely a lot on a really old Donna Hay book which I regard as essentially fool proof. The Quiche looks great as well! Becca, thanks for the reco! GC, it's a lovely quiche. Haven't got any Donna Hay, any titles you particularly recommend? Kavey, I made this quiche last night – a real success, totally delicious. Even if a person were to get in a muddle and use a loose bottomed tin in place of the usual foil and beans the recipe wouldn't fail. Obviously only a fool would do this but this pastry is forgiving and wonderfully short. Thank you for posting this.